When you offer a superior level of service, word spreads quickly. 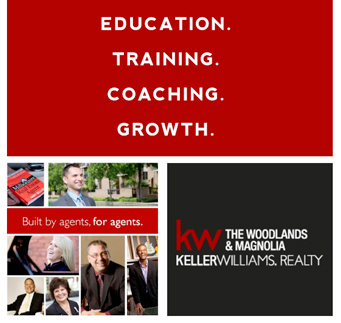 The agents at Keller Williams The Woodlands & Magnolia are on a different level due to our unique training, coaching, marketing and technology solutions. Frequently recognized as the most innovative and agent-friendly brokerage in the nation, Keller Williams The Woodlands & Magnolia is a gathering place for our area’s best real estate agents. So, with all of the choices in the market, why choose Keller Williams for your real estate needs? We use leading-edge tech tools and training to give our agents the advantage in marketing your home to the greatest number of buyers for the quickest possible sale. Unlike other agencies, Keller Williams rewards its agents for working together. Our agents adhere to the philosophy that we are all more successful if we strive towards a common goal rather than our individual interests. At Keller Williams The Woodlands & Magnolia, your needs always come first. We work with each of our clients in the ways that work for them, whether once a week, once a day, by phone, email or text message. We always keep you in the loop of what is going on. We were just named the Best Real Estate Agency in The Best of The Woodlands 2015!